Hiking is actually the only way to discover the beauty of Costa Rica. While walking through nature you will discover things you would never have discovered while flying, driving or even running. 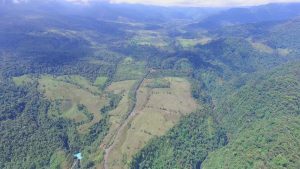 We guess you came to Costa Rica for nature in the first place so, hike in peace and open your senses and you will be amazed. And besides that, it is very healthy, it clears the mind and cleans up the body toxins. We offer some nice hikes. 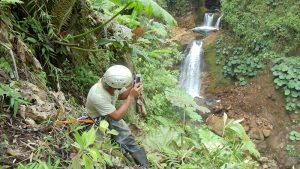 The first trail is a self-guided tour all the way to the bottom of the most impressive waterfall of Costa Rica which is second to none in beauty and splendor. It throws itself 90 meters into an old extinct volcanic crater. First 500 meter of the trail is flat and has several fantastic lookouts; second part is also 500 meters with steps with high impact. People with heart conditions or any other medical condition, older people, pregnant women, etc. should not go down. For the rest of the people they need to take their time coming back up. The 350+ steps are safe and partly made of concrete and it has several sitting areas and views are incredible. 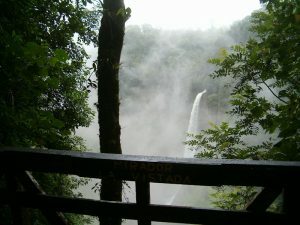 Whoever takes the effort to go down will get the best waterfall experience of Costa Rica! Duration: 90 minutes including the forest- and garden trail. Price: Included in entrance fee. While hiking down do not forget to look up once in a while to enjoy the rock formations of this ancient volcanic crater and all its colors. Probably you will also notice the special chemical composition of the water. The second trail leads you through the forest to the garden. 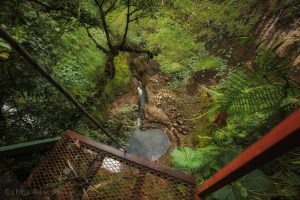 This easy hike brings you to the edge of the crater from where you easily can spot the waterfall from different angles. Besides that, the trail goes through a primary forest with has some nice trees. And has also a spectacular view of the canyon and the national park. Make a walk in our ever-under-construction-bird-garden which its primarily purpose is to attract birds and other animals. Therefore, we have been planting lots of fruit trees from the area which will attract numerous birds under which the Toucan and the Quetzal as the ultimate goal. Also, bananas for the monkeys and birds and bushes with flowers which already attracts hundreds of hummingbirds, heliconia’s, etc. Soon we will make some extra seating areas from where you can enjoy the amazing views in peace. We apologize that it is still unfinished but like all good things in live: It takes time, but it is coming up. There is actually a third trail that leads you to the rappel section. But for security reasons this is permanently closed as you end up at the edge of the 90 meters drop without a fence. If you want to go ask permission and maybe we will let you go. Park your car at Catarata Del Toro and use the restrooms and get your ticket. From here we will start walking over the public road and we will cross a beautiful farm with nice views and trees. Also, we will cross a river by a bridge, until we end up in the blue river. Approximately thirty minutes till this point and … read more. Total Walking Distance: 4.5 km. Park your car at Catarata Del Toro and use the restrooms and get your ticket. From here we will start walking over the public road and we will cross a beautiful farm with nice views and trees. Also, we will cross a river by a bridge, until we end up in the blue river. Approximately thirty minutes till this point and then… read more. Requirements: You need to be in extremely good physical shape. Instead of hiking the regular trails, maybe you want another experience? 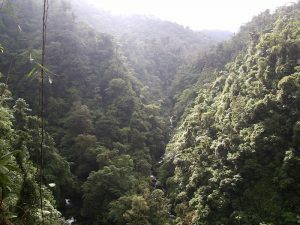 Just straight through the forest and rivers and maybe some rappelling included? Just ask and if we have a tour guide available probably we can arrange something, charge will be by the hour. Also, the area itself offers many opportunities for hiking, however it is still under-developed. You can think of trails going to the Poás, into the national park Juan Castro Blanco, Cerro Congo and others. Sorry….but we cannot offer this tour anymore since the manager of the Poás Park had notified us. 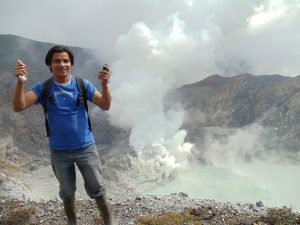 He does not allow us to come to the edge of the crater anymore, so, we won’t. Since April 2017 the Poás has been very active, only recently the park has reopened. The tour was a walk of seven hours total, four hours up and three hours down. If you will ever make this tour one day, you will never forget it. The pictures are just for illustration purposes only, and to show you the beauty. As our own area is very nice and it is growing and developing in the right directions. 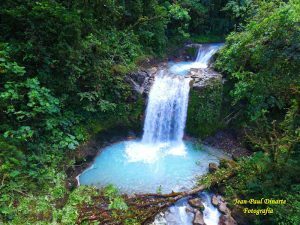 We do not want to withhold you the best hike in Costa Rica: Chirripó!We personally did it and it is highly recommended. 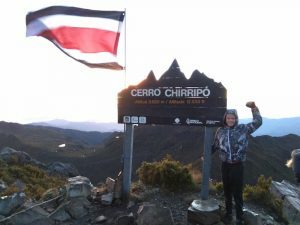 More information about that hike: https://www.chirripo.org/or if you want to get help with the booking process, hotels etc. please contact: Ingrid Sancho at misanchow@gmail.com. She did a great job for us and if you want to have a private tour guide who will bring you up, no matter what, please ask Ingrid Sancho to contact Gilbert Dondi for you.